Melanin, a dark macromolecular pigment, protects skin from harmful damage. However, abnormal accumulation is responsible for hyperpigmentation disorders. Melanogenesis inhibitors have therefore become important constituents in cosmetic products for depigmentation. Torilis japonica Decandolle (Umbelliferae) is a biennial plant which is distributed in East Asia. Fruits of this plant have been used for the treatment of skin disease and inflammation. 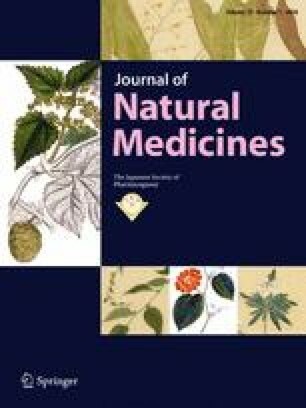 In our previous study, torilin, a major sesquiterpene of T. japonica, showed an inhibitory effect on melanin production in α-melanocyte stimulating hormone (α-MSH)-activated B16 melanoma cells. Further extensive chromatographic separation resulted in thirteen compounds. On the basis of spectroscopic analysis, the structures of the compounds isolated were determined to be three new sesquiterpenes, viz. a guaiane-type, epoxytorilinol (1), a eudesmane-type, elematorilone (2) and a cadinane-type, cardinatoriloside (3), together with ten known sesquiterpenes (4–13). Of the compounds isolated, compounds 4–6 and 11–13 inhibited α-MSH-activated melanin production in B16 melanoma cells with IC50 values from 72.9 to 191.0 μM. This work was supported by Basic Science Research Program (2015R1D1A1A09058498) through the National Research Foundation of Korea.